See Region Detection for the details. We will be grounding the pin that relates to light gun input so it fails the region test. Open the switch to restore light gun compatibility after a game boots in Japanese mode. This mod is dangerous to your system's health. 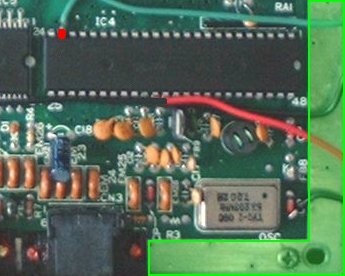 It is grounding a pin that should not be grounded, which may cause permanent irreparable damage to the I/O chip, which would make the light gun fail to work or potentially kill the whole console. On some hardware revisions, it does not even work. Having said that, it is the only hardware region mod available. The pin in question is tri-state, the I/O controller can choose to drive it high or low, or let it float, and it can read its current value. The region check works by driving it high or low and then reading its state (because this functionality is absent in Japanese consoles). By forcing it to ground, you are attempting to override the chip's output. The controller ports include components to protect the chip from this (e.g. if a button is held down during the region check), but for this mod to work, it is bypassing that protection. The result may range from nothing to irreparable damage to the I/O chip, or worse. Connect pin 34 of chip 315-5216 to a switch connected to ground (eg. the large ground planes surrounding the board). Closed = Japanese, open = Export. Red = pin 34. Green = ground. Photo/diagram by Raccoon Lad. 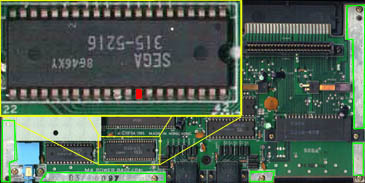 As above, but connecting to pin 23 of chip 315-5237. Red = pin 23. Green = ground. Photo by Mike G, diagrammed by Maxim.